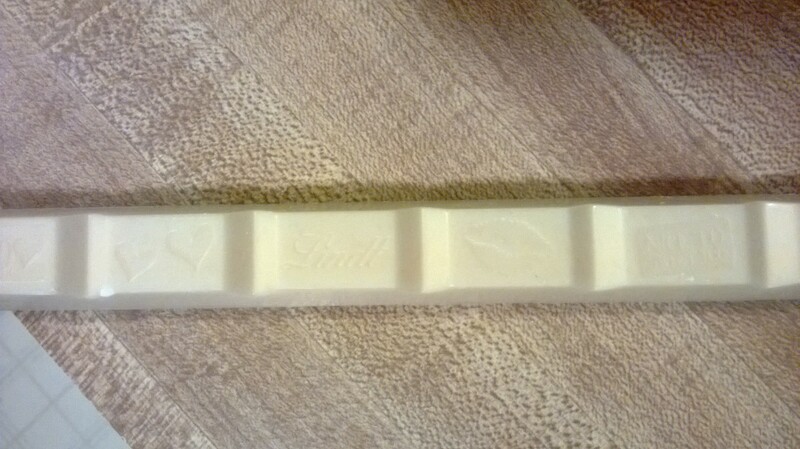 On vacation in South Carolina a few months ago, I ran across a Lindt Caramel Brownie stick at a Target. 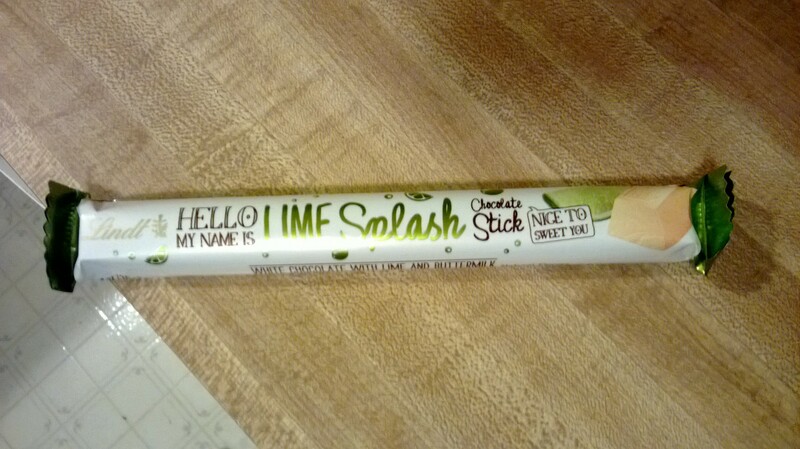 This was the first time I’d ever seen any sort of chocolate product actually calling out to me (The wrapper actually says, “Hello, My Name is…) and since I simply adore caramel and brownies, I had to have it. I enjoyed it quite a bit (and will write a review of it on here soon), but when I got home, I noticed a plethora of equally tantalizing sticks all beckoning to me at my local Target. I had to swoop one of every flavor into my cart. For this review, I sampled three of the sticks: Lime Splash, Berry Affair and Coconut Love. Although I usually dive head first into milk chocolate, I was running a bit low on available calories last week, so I decided to start with the stick with the fewest. Although they are all within 20 calories or so of each other, Lime Splash is the lightest, so that’s where I started. And, since I started with the white chocolates, I figured I might as well nibble them all and do two reviews, one on the whites and one on the milks. The Lime Splash stick threw me for a loop. When I tried the caramel brownie one, it was chocolate surrounding brownie pieces linked with chocolate surrounding gooey caramel. So, I was expecting some sort of liquidy lime filling. Instead, I was met with a wall of white chocolate. Now, it was white chocolate infused with very tart hints of lime, which sort of reminded me of a solid version of a key lime pie. It was a very bright lime flavor which lingered in my mouth and almost made my teeth tingle a little because it was so sweet. Thankfully the teeniest, tiniest hint of buttermilk in this stick mellowed the lime out just a tad. 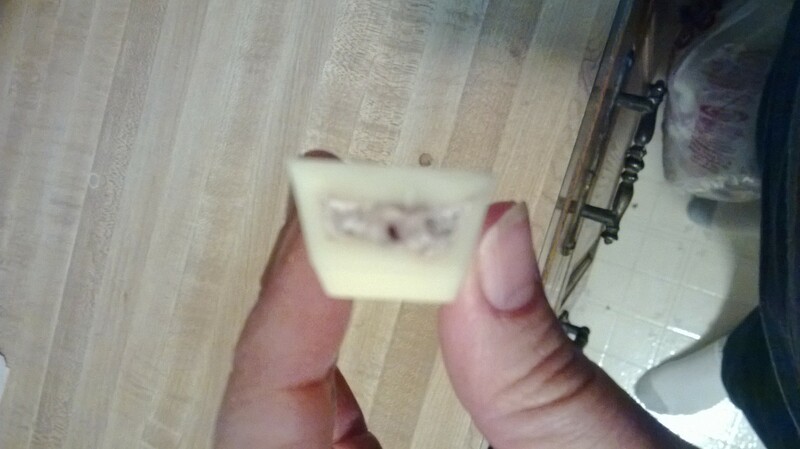 However, the little flavor crystals inside the bar, which reminded me of those crystals in mints, gave it a bit of a grainy texture. Even though I liked the taste, after half a stick I had to stop. It was just too sweet for me. I put the other half in my lunch box, thinking it’d be a treat for me one afternoon, but so far, I haven’t really had a desire to eat it. I have a feeling I’ll end up giving the rest of it to one of my students. They’ll eat anything. A few days later I decided I really needed to try the next stick. 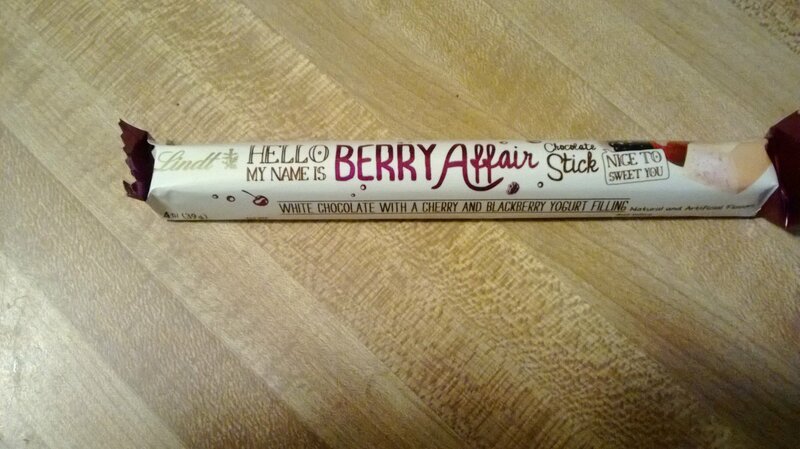 I wasn’t overly enthused about it, especially since I figured Berry Affair would also be a solid chunk of chocolate with some flavor crystals, but thankfully this one had a bit more texture. The white chocolate was quite creamy and it lacked the graininess of the lime bar. It also had a filling of sorts. Now, it says right on the wrapper it has a yogurt filling, and it was yogurt, but not what I expected of yogurt. Once again, instead of being a liquidy filling, this yogurt was sort of powdered. It absolutely tasted like yogurt, but the texture just messed with my brain a little. It also tasted a bit like Smartees. I’m not sure if my brain made that association because it was powdered yogurt, but that’s all I could think of as I ate it. However, this one also had real pieces of dried cherries and seeds to give it some additional texture, which I really enjoyed. Of the three, this was definitely my favorite, although I have still yet to eat the other half of it. 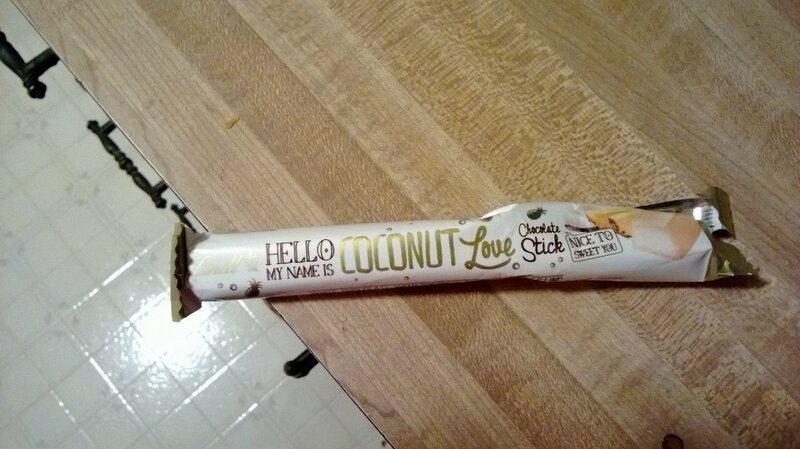 Tonight I figured I should try the last one: Coconut Love. Now, I am usually a huge coconut fan. I love coconut cake and the mere thought of the coconut pancakes I had one summer in Jamaica still makes my mouth water. However, the one way I just don’t like coconut at all is in the form of a pina colada. Now, I don’t understand why this is. I like rum, I really do. I downright love pineapple. However, when it comes together with coconut, there is just something about the flavor that I just don’t like. Not one bit. This one tasted like a pina colada. It had that citrusy hint (although a little more lime than pineapple) and all I could think of was that one section was all I was going to eat. I did like the little flakes of real toasted coconut that were in it, but it was so sweet that I was done after one bite. It is no secret among my students that I’m a chocoholic. In fact, I’d say my love of chocolate gets brought up in class at least once a day. Usually, either by my Advanced Placement kids (who have had me for two years in a row, feel they know me pretty well, and like to give me a hard time) or by me as an example for some vocabulary word or allusion we are learning. Every day we learn the origin and meaning of a new allusion in hopes that someday when they run into the allusion in something they are reading or watching, they’ll know what it means. For example, the other day our allusion was “Siren Song.” For those who don’t know, this is a reference to the Sirens of Greek mythology who were beastly monsters, often disguised as beautiful women, who lead sailors to their deaths with their irresistible songs. So, when someone refers to something as their siren song, it is that temptation they just can’t turn away from that leads to their destruction. Since I like to give my students practical examples, I brought up the fact that chocolate is the siren song to my diet. They all get it and are amused by how many examples I can truly create based on my chocolate addiction. Now, I’m not bragging or anything (ok, maybe I am, just a teeny bit), but my AP kids and I have some pretty darn good relationships. So good, in fact, that they even bring me in treats now and again. Just last week I was offered donuts by two different students and despite really wanting them, since I’d already had breakfast, I did the right thing and turned them down. But then, on Friday of last week, one of my little darlings came in with a box of chocolates for me. 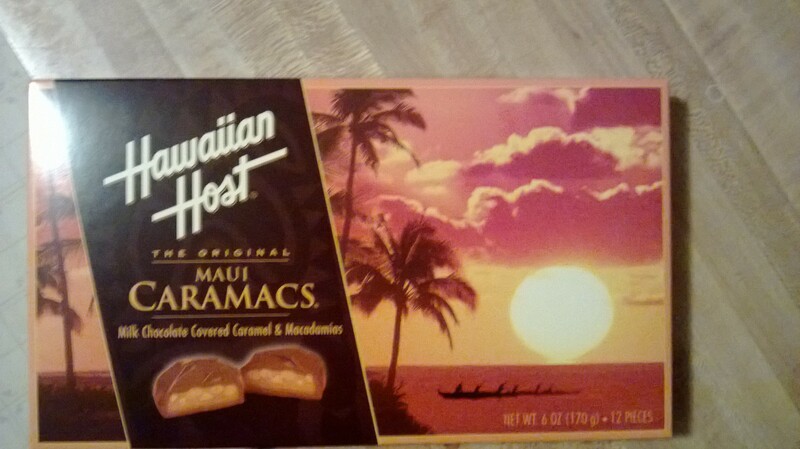 Yes, that’s right, almost an entire box of Maui Caramac chocolates. She opened them, took one out for herself, gave one to her friend, and then handed me the other ten. I was rather flabbergasted. 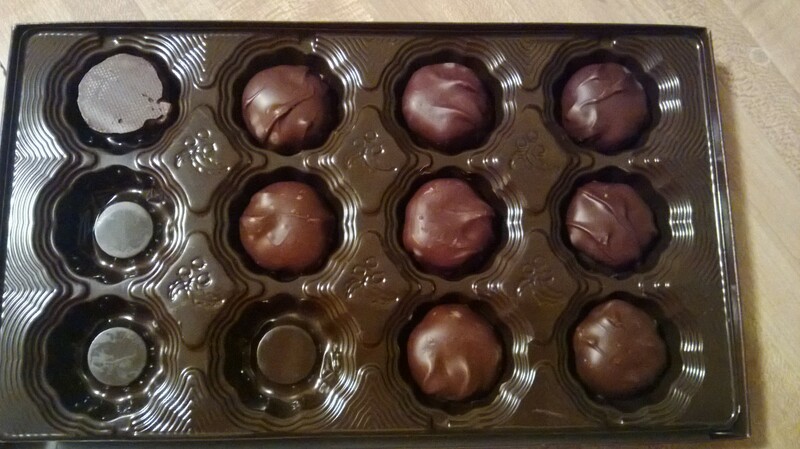 Usually I get offered a piece or two, but not an entire box of chocolates. I thanked her profusely for the treats. Of course, that’s when she threw in the catch. She begged me to move the class discussion over Their Eyes Were Watching God one day later because she and another student were going to be on a college visit the day of the discussion and they both wanted to be a part of it. I agreed to think about it and she agreed to leave the box of chocolates in my room. And it sat there all day. I’m not going to say I’ve never moved a deadline before, but in 15 or so years of teaching, I’ve never had a student actually bribe me to do it. I’ve had them offer hypothetical bribes of $20 or $50, but no one has actually ever shown up with the cash and waved it under my nose. But this, this was chocolate. And it was sitting right there on my podium, just staring at me. It was hard to avoid. I’ll admit it, I caved. Not just for the chocolate though. I was already contemplating moving the date since several people were going to miss both of the scheduled discussions due to college visits (that’s the problem with teaching highly motivated, academically gifted kids, they all have ambition), and by moving each one by one day, I’d avoid all the kids who’d be gone. This meant not only that everyone could participate, but that I wouldn’t have to grade the papers I make them write when they miss a discussion. Everybody wins! And, I get chocolate to boot! The chocolates in question were sent to my student by a relative who lives in Hawaii. Her entire family actually used to live there when she was younger, and since she still has family there, they send her care packages all the time. I remembered her offering me these same chocolates last year, but then I’d declined. Now, I love a good turtle and these looked to be a macadamia nut version. I’ve never really been a huge fan of macadamia nuts. Growing up in Southern California they were everywhere. My folks loved them and snacked on them all the time. I found them to be kind of bland. Plus, when they are baked into cookies, they often get sort of waxy and mushy, which I’m not a huge fan of. Give me an almond or a pecan any day. Those are strong, tasty nuts! But, they were something new and I’m always up for a new chocolate adventure. The chocolate shell doesn’t have a lot of flavor. It’s sweet, but not overly so. The caramel is super sticky and very chewy. Even warmed to room temperature it took a lot of chomping to get through. It’s also sweet and slightly buttery, but doesn’t have the creaminess I love in a caramel. The macadamia nuts are pretty innocuous. They add the tiniest hint of crunch, but honestly the caramel is really what gives this candy the texture. There really isn’t a salty taste from the nuts, no crunchy texture and no real flavor from them, so I’m not sure what purpose they serve other than to set these candies apart from regular turtles, therefore making them exotic and possibly peaking people’s curiosity. I found them a bit bland. If they hadn’t been given to me, I wouldn’t have sought them out. The good news is that if you like macadamia nuts and you either live on the West Coast or visit airports in Chicago, New York, Texas or Boston, they are pretty cheap. A box of 12 runs $4.25. However, considering their relative scarcity for most of the country, the shipping charges make them really not worth it in my book. When I was a kid, my mom signed me up for Girl Scouts. Now, I was not against this endeavor at all. In fact, since most of my friends were also in the same troop, I desperately wanted to join. Back then, I thought camping was fun. I didn’t mind the bugs or sleeping on the ground or throwing everything that had not yet been consumed into some tinfoil, tossing it on the fire and calling it “hobo stew.” In fact, I thought it was spectacular. I longed for camping trips and when one was on the horizon, I got nearly giddy putting all my gear together. As I’ve grown older, this misguided enthusiasm for the great outdoors has waned considerably. Don’t get me wrong, I see the beauty of nature and all that good jazz, I just prefer to view it from inside the comfort of my air-conditioned home. Or, if I do venture out of doors, I like it to be safe within the confines of my screened in porch where those nasty little blood sucking insects can’t attempt to drain the life from me. I know it sounds so incredibly wimpy of me, but it’s not like I was ever a good camper, just an energetic one. I mean, I never could figure out how to lash anything together the way I was supposed to. Forget making a campfire. I knew the science behind it, but there was no way I was doing it without a lighter or some serious matches. Even as an adult, when we’d go on group camping trips, I was always the one who snuck out of our “primitive” camping space and hoofed it over to the showers, preferring to fight it out with the spiders rather than go without a good cleaning. I think that is what put the proverbial nail in the coffin for me…I got tired of showering in flip flops beneath icy water, only to have to flee after three minutes because an arachnid the size of my fist decided he too needed a good rinse. The only aspect of camping which has never lost its char for me is the s’more. As far as I am concerned, there is almost no dessert treat that can rival a freshly made s’more. 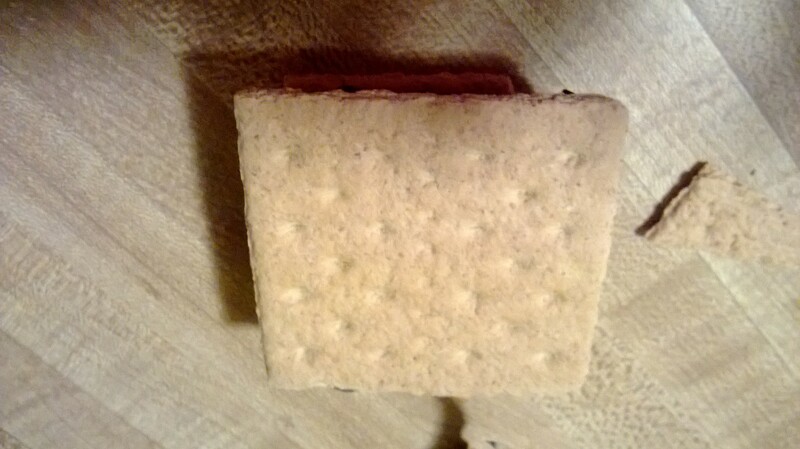 I’m not even really a marshmallow fan (don’t even get me started on what an abomination Peeps are), but there is just something about taking a lightly toasted, slightly gooey marshmallow and slipping it on top of a few Hershey squares between two graham crackers that makes my heart flutter. 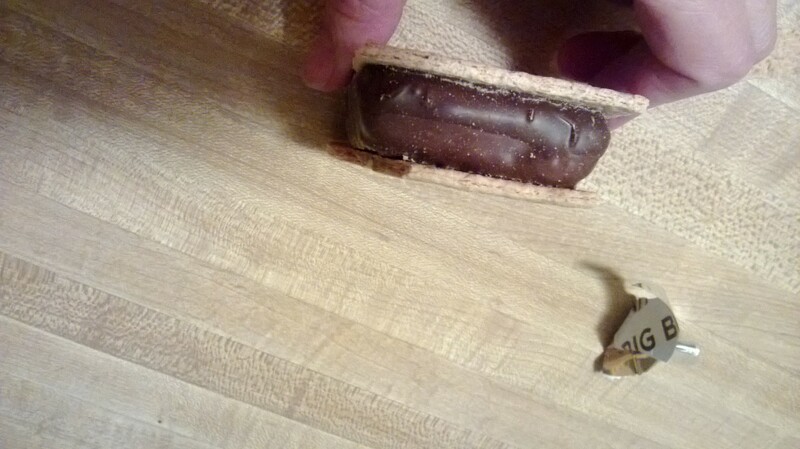 I still remember when we got our first microwave, one of our first experiments was making homemade s’mores. We all gathered ’round to see that giant mallow expand to about 10 times its normal size, patiently awaiting the moment my mom would take it out, build the treat and hand us the plate. For awhile one of the cookie companies even made a microwave s’more. I wish I could remember the company, but I was like 8 at the time. 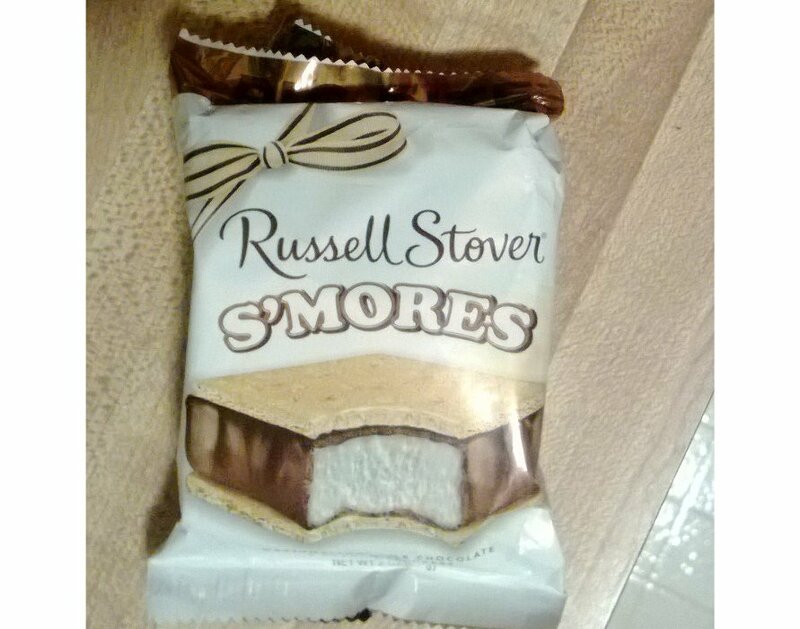 Now, I know it’s not hard to make s’mores in the microwave, but when I saw that Russell Stover had a candy version they were marketing, I knew I had to try it. I did not really have high hopes. Marshmallow candy is almost always abysmal (glaring at you Peeps). I can’t think of a single marshmallow-like candy I have ever enjoyed. Circus Peanuts, Peeps, those odd little pink, brown and white candies that used to be in the Brach’s bins, chocolate covered marshmallow eggs…all had to be invented by very sadistic people who wanted to make kids think they were getting a yummy treat just so they could later laugh when they saw the look of horror that crossed the faces of those poor, unsuspecting youngsters. I have to admit, I was very pleasantly surprised. The marshmallow was not overly soggy or chewy like I’d feared. It was a pleasant, fresh marshmallow that had none of the cloyingly sweet, overly sugary flavor of other marshmallow travesties. While it was not really melty the way a truly toasty fire blazed mallow is, it was slightly gooey and aside from not being warm, pretty near perfect…for a marshmallow. I was also nervous about the graham crackers, but there was no reason to be. They were fresh and crisp, as if they were out of a freshly opened packet. They had a great crisp to them, but were not so brittle that they broke into a million pieces when I bit in. 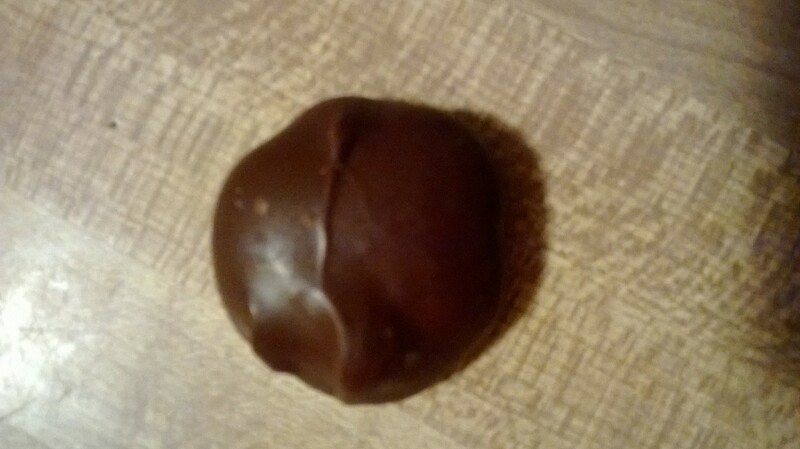 The chocolate, despite looking a bit like Magic Shell, did not taste at all fake or plasticy like I thought it might. It definitely had a manufactured plastic-like sheen to it, but it was actually creamy and tasted every bit as good as a Hershey bar on a good ol’ fashioned version. It was amazingly balanced with no one taste overpowering the others. What I thought could have been the biggest chocolate horror show since those damn Easter marshmallow eggs, turned out to be not only palatable, but actually quite pleasant. When I was done, I found myself wishing I’d stocked up on them. Ok, so they still aren’t as good as their fire-roasted brethren, but it was over 90 degrees here yesterday, so considering that the thought of lighting a fire makes me want to melt, this was a great substitute.